fits and assembles, by filing, screwing, etc., with hand tools, component parts of air speed indicators; usually done by revolution indicator maker (q.v.). mounts, on wooden or other frame, movements and dial of aneroid barometer, and fits-on bevel and glass covering of dial by hand, using small hand tools; may also clamp to frame a small thermometer, when such is required to be fitted; cf. movement maker, aneroid barometer. (ii) draws from stock, metal or wooden barometer parts, including glass tubes, already filled with mercury and fused at ends by a glass blower (124) (q.v. ), and mounts tube to wooden or iron frame, with screwdriver and clamps; screws into position, scales, etc. ; tests assembled barometer, and, if incorrect, bores hole through glass tube, adds or withdraws mercury as necessary and seals tube; cf. barometer maker, mercury. makes any part of mercurial barometer, by hand; where barometers are to be fitted in a metal tube, turns length of tube to required size in a mechanically-driven lathe; fills tube with mercury, and, after testing quantity of mercury in tube, seals up tube in a blow flame; sometimes also makes screws, used in assembling barometer, in an automatic screw-making machine; assembles barometer parts; cf. barometer assembler, mercurial. (ii) see barometer assembler, mercurial. general terms for workers at a bench with vice and hand tools, fitting and assembling scientific instruments, e.g., microscopes, telescopes. a lens adjuster (q.v.) who eliminates errors of alignment in binoculars or field glasses. assembles, by hand, finished parts of binoculars or field glasses, using pliers, screwdriver, small files, etc., and fits lenses into position using a hand burnisher. a framer (q.v.) who finishes machined parts of frames for binoculars or field glasses by fitting, filing and polishing. an all round man who can make any part of a binocular, i.e., can make any of the cells, mount lenses therein and fit them into the body of binocular. (ii) an instrument maker (q.v.) who makes very delicate adjustments, with small hand tools, to shutters of expensive cameras. bores holes for screws in wooden camera bodies, cuts wooden surface to receive hinges, plates, and other fittings; fits together wooden parts, and adds metal hinges, corners, and other brass work; sometimes done by camera finisher or by camera maker (q.v.). makes wooden or metal camera bodies; cuts wood to size by treadle operated fretwork machine or with hand saw; planes, dovetails and sandpapers cut pieces of wood with hand tools; for metal bodies, usually aluminium, stamps out parts, using stamping press, drills with hand or machine drill, and polishes by hand; machine tool workers (200), and press workers and stampers (254) (q.v.) usually employed for mass production work; cf. camera cabinet maker (473). general term for any person engaged in any process in manufacture of chemical apparatus, e.g., glass grinder, graduator, or divider, thermometer; but usually refers to a glass blower, e.g., clinical thermometer blower (q.v.). a thermometer tube blower (q.v.) who specialises in clinical thermometers; cuts with file short lengths of special glass tubing to form stem and bulb; fuses ends in blow flame, draws out and joins stem and bulb; draws away surplus glass with tweezers; loads with mercury either by placing open end of stem while hot in pot of mercury, or by placing in vacuum jar where by operating valves mercury is forced into tubes; seals open end with wax; softens stem in flame near bulb and forms constriction in capillary; tests scale in water bath against standard thermometer; if correct completes by closing end in blow flame. a thermometer divider (q.v.) engaged on some or all processes of dividing, etc., clinical thermometers. adjusts balance of compass points by filing or otherwise; in case of compasses having fluid support for floating pointer, also adjusts level of such compasses. makes up compasses from stamped, pressed or turned parts; adapts parts as necessary, in fitting, with small hand tools or on small lathe; adjusts the parts, as for compass adjustor, and finishes by polishing or other finishing process. cuts standard curves, using patterns, for use of draughtsmen, from thin sheet hardwood or celluloid by means of a fretwork machine, which he works either by switching on and off power-drive, or by foot treadle; polishes curves by hand, using various polishing materials. assembles and fits together stamped, pressed, or die cast standard repetition parts of cyclometers, using small hand tools; files, cuts, etc., parts as necessary in fitting. draws on paper, plan of proposed sun dial, having first ascertained latitude of place of its erection, and, for vertical dials, also bearing of wall on which to be fixed; sometimes also makes, by hand, model of proposed dial in cardboard; works out hour, minute, month and day markings by mathematical calculation. (ii) by machine; places rulers in engine dividing machine and, measuring against various mathematical divisions shown on machine, operates, by hand, a swivel device governing a cutting edge which marks divisions on rulers, etc. ; sometimes specifically designated, e.g., engine divider, hand divider. is engaged on some or all processes of pointing, dividing and marking thermometer tubes; in pointing, places racks of filled tubes in heated water container, and, checking from a standard thermometer, marks tubes with a pointing knife as certain temperatures are reached; in dividing, dips tubes in beeswax, or, receives them already coated; clips a coated tube under needles of dividing engine, and sets engine to mark required number of divisions between points; manipulates a hand wheel so that engine needles cut divisions in wax coating; in figuring, works pantagraph to trace figures, maker's name, etc., in wax; in marking tube, dips tube in bath of fluoric acid which marks tube where wax is cut; soaks tubes in paraffin to remove wax and acid, wipes tubes dry and rubs asphaltic black, or similar preparation, into divisions, figuring, etc. ; cf. clinical thermometer divider, thermometer figurer, thermometer pointer. dresses metal castings by hand, using files, etc., and finishes off with emery wheel or, more generally, polishes them by hand, using fine polishing paper and then a buff stick; drills and screws together, if necessary, dressed castings to make drawing instruments. turns on lathe parts cf frames which have not been cast, for use in microscopes, etc. ; feeds lathe with material and operates machine by means of hand levers; may also finish off by hand, filing, etc. ; cf. binocular framer, lens mount maker. (ii) from temporary marks so made, etches permanent indications. assembles machined parts of heliographs, he., apparatus for signalling by reflecting flashes of sunlight, and finishes them by means of emery wheel, rag dolly, file, or acid bath, as required. puts into a double glass bulb, having small hole at one end, a quantity of very fine sand sufficient to run from one bulb to the other in time required to be indicated; stops hole with finger and checks time taken for sand to fall into bottom bulb; adds or removes some sand if necessary; after testing, seals bulbs in flame of blowlamp, and mounts it, by screwing, in metal or wooden holder. makes hydrometers, instruments for measuring specific gravity of liquids or for ascertaining directly, by an adjusted scale, alcoholic content of fermented liquors; receives blown hydrometer, cf. blower (124), and fills lower bulb with mercury or shot, by hand; dips hydrometer into water having specific gravity of 1'00, and marks, with pointing knife, water level on stem; wipes instrument dry and repeats operation in fluid of 1'10 specific gravity; divides distance between these two points, and marks-out degrees on paper or ivory, by means of dividing engine, cf. divider, thermometer; inserts scale inside hydrometer stem and tests to see if correct; seals junction between two bulbs by pouring wax through hydrometer stem, and fuses open end of stem in blow flame. makes levelling tubes of inclinometers, curved spirit levels, by heating pieces of glass tubing in blow lamp and forming to shape required; fills tube with spirit and seals off; mounts tubes so formed in a cast metal frame, marked with necessary graduation. general term for any worker employed in making parts of scientific instruments, or fitting parts together; term also applied to proprietors of one-man businesses who do all their own making and assembling. does minor repairs to broken stamped-out spectacle frames, chiefly imported, by soldering; cf. spectacle frame maker. assembles lenses in mounts in correct position; collimates and eliminates errors of parallax in single optical systems; by throwing image of light on a screen and by altering thread of, screw, obtains beet defined image; tests alignment in binocular systems by throwing image of light on a screen. takes an optical system in its elements, and mounts these, at a given separation, in a series of metal tubes or cells by screwing sections together upon lens, taking care to maintain optical alignment. an optical turner (q.v.) engaged in turning settings or cells of lens mounts by means of an automatic lathe; turns to required thickness parts of cells which have been cast, or stamped, pressed, or otherwise formed from sheet metal or tube (brass, aluminium, etc. ); chases screw threads on metal parts, either with a hand, or, with an automatic screw cutting machine; polishes parts by hand with a buff, or, with automatic polishing machine; smooths uneven movements, trues-up any parts bent or "out of true," assembles mount and fits iris, shutter, etc., in photographic lens settings, etc., by hand. makes throughout painted and graduated wooden levelling staves, used in surveying work; saws wood to length, by hand; removes roughness by sandpapering, etc. ; caps body with brass caps and binds stave, two-thirds way up, with strengthening ferrule; paints and finishes stave, by hand, including painting of divisions and letters thereon. (ii) machine engraver (mathematical instruments ); fixes in pantagraph machine work to be engraved, and template engraved by hand engraver; by tracing over template reproduces, by means of automatic pantagraph cutting tool, engraved pattern on metal; regulates pressure of cutter on material; removes engraved metal from machine. general term for any worker engaged in any process of making mathematical instruments. makes mathematical -rules in metal, wood or ivory; cuts to size with handsaw, planes-up material and bevels edges by hand or machines; smooths and finishes off rule by hand, using file, sandpaper or other abrasive; sometimes also divides rule in dividing machine, cf. divider, thermometer, or by hand, using marking tool, set square and scale; rules sometimes made by drawing instrument maker or by mathematical instrument maker (q.v.). an instrument maker (q.v.) who assembles and fits parts of various patent devices in which motive power is provided by clockwork. general term for any worker engaged in making barometers, rain gauges, or other meteorological instruments; cf. aneroid barometer assembler, barometer assembler, mercurial; thermometer tube blower, divider, thermometer, etc. an instrument maker (q.v.) who sets and operates machines in which micrometers are machined or dressed, ground, and divided or marked in degrees; accuracy of setting machines and in manipulating micrometers in marking, etc., essential. an optical instrument maker (q.v.) who dresses, with hand files, cast parts of microscopes; turns other parts on automatic lathe and polishes all parts by (hand or machine; drills with hand or power drills, holes in frame parts for assembling purposes; chases screw threads by hand, with screw cutting machine or automatic machine; completely assembles parts, including lenses and iris, using small hand tools, and adjusts microscope to proper vision, by focussing; sometimes himself grinds microscope lenses 'on small spindle lathe, either receiving roughly ground lenses or commencing with block glass; passes ' lenses through series of revolving moulds of increasing curvature on lathe, and proceeds as for hand finisher (138) (q.v.). files plate, on which are fitted movements of barometer, by hand to correct size; makes vacuum box, regulator, pulley, pointer, etc., either with hand tools, or, by means of automatic machines, e.g., stamping, spinning, turning, screwing, drilling machines; polishes parts either by hand or machines, assembles parts with small hand tools and screws movements on plate; tests range, i.e., distance traversed by pointer, on dial, and reading of barometer by placing it in vacuum pump; if readings incorrect, adjusts barometer by means of screw fitted on the tension. general term embracing several occupations concerned with making instruments for use on board ship, e.g., compass maker, ship's log maker, sextant frame maker (q.v. ), etc. a lens mount maker (q.v.) who makes mounts for object glasses of optical instruments. general terms for any person engaged in making optical instruments, including microscope maker, telescope maker (q.v.). turns, spins, polishes, and chases brass or aluminium parts of photographic lens mounts, telescopes, microscopes, and other optical instruments, by means of automatic machines; feeds machines with material; sometimes polishes parts by hand, using polishing materials; sometimes assembles parts to form complete mounts and lacquers brass surfaces. makes parallel rules; for rolling rules, cuts strip brass to length by hand punch or machine; planishes brass with hammer and planes smooth with hand or machine plane; bevels one or both edges in bevelling machine and drills brass with hand drill to receive screws; turns out rollers for rule and lifting knobs, on automatic lathe; makes decorative saw cuts on rollers by machine, and stamps, by machine, supports on which rulers are fitted; polishes finished rule by hand, using polishing materials; sometimes makes roller wheels on a wheel cutting machine; fits spindle through each roller and assembles parts by hand, using screws, screwdriver, etc. ; in malting plain rules, cuts wood, ivory, or metal strips to size, hand or machine, bevels edges by machine and polishes by hand; cuts and shapes strip brass with hand tools or stamps it out by machine; fits brass bars so formed, across to wood, etc., strips, with screws, to complete parallel rule; work sometimes done by drawing or mathematical instrument maker (q.v.). assembles and adjusts machine-made parts of pedometers, and fits them in metal cases. (ii) less skilled, assembles, by hand, using small hand tools, machined parts of pressure gauge, fits by filing, etc., and tests finished gauge by means of pressure pump. assembles and fits together turned metal parts of revolution indicators, speedometers, etc., together with hair spring, clockwork, indicator, dial, etc., using small hand tools; polishes up indicator by hand with polishing materials, and tests by attaching it to an electrically-driven standard revolution indicator; alters tension of springs on dial if indicator not up to standard; often also does similar work in making, e.g., air speed indicators; cf. air speed indicator maker. drills holes in lenses with power driven diamond drill; fixes lenses in mounts and secures with small screws, using hand tools. turns castings on automatic lathe to form sextant frames; mills certain parts on lathe; finishes by hand, using files, etc., and polishes by hand. makes parts of ship's logs in copper or brass, by turning, machining and filing; and assembles and adjusts thorn. makes up frames or mountings of spectacles, eyeglasses, monocles, etc., in steel, nickel, rolled gold, gold, or other metals; if necessary, first draws his own wire through die; fashions frames with small hand tools, and solders joints using soldering irons, etc. ; fixes in position, with screws or solder, supports which hold "sides"; if necessary, cuts tension springs, with hand pliers, and solders same on support bar of eye-glasses by hand; sometimes, although seldom, makes own screws, using screwing machine; cf. jobber. (ii) assembles spirit level in a finished case, and fixes in position cover for levels and scales, with screws. a pressure gauge maker (q.v.) engaged in making steam gauges. an instrument maker (q.v.) who cuts and smooths surface of brass sheet for sun dial, by mechanically driven machines or by hand; files sheet to pattern, with hand files, marks hour, minute, month and day divisions on dial with sharp edged tool and straight edge, from plan supplied by dialist (q.v. ); screws nomen into position on dial, with screwing bolts, by hand. 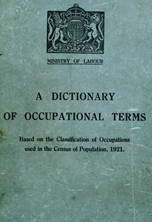 general term for any person engaged in making surveying instrument, e.g., levels, staves, etc. takes steel tape of tape measure after it has been marked; polishes it; rivets end to winding axle; winds it in leather, metal, or fibre case, and rivets on loop by which it is drawn from case; sometimes cuts, and screws into position, actuating spring; in small factories, may also perform duties of tape measure marker (q.v.). passes lengths of steel tape through a marking machine, in which measuring rollers, engraved in relief, mark or cut through a fine coating of acid to be etched on the tape; or, similarly, marks where spaces between lines are to be etched in a subsequent bath of acid, so as to leave a raised series of marks and figures. assembles, fits by filing, drilling, screwing, polishing, etc., and generally adjusts machine-made parts of taximeter. an optical instrument maker (q.v.) who draws from stock, builds-up by hand, and screws into position, component parts of telescope; screws in position lenses, received already mounted; if necessary, adjusts telescope by focussing; sometimes makes his various mounts by turning same on automatic lathe, and polishing them by hand with polishing materials. figures thermometers; is engaged in works where operations of pointing, dividing, etc., thermometers are sub-divided among different classes of workers; cf. divider, thermometer. points thermometers; is engaged in works where operations of pointing, dividing, etc., thermometers are sub-divided among different classes of workers; cf. divider, thermometer. general term covering thermometer tube blower, thermometer divider, thermometer mounter (q.v.). mounts thermometer in a wooden, metal, ivory or glass frame by hand, using small hand tools; screws thermometer into position on mount with clamps and screwdriver; sometimes cuts special mounts from thin sheet brass, by hand, and may also mark divisions of thermometer scale on boxwood or brass mounts, by sliding a gauge along mount and marking divisions with knife; numbers divisions, using dies. blows thermometer tubes from glass cane, according to particular type of thermometer, e.g., small bore tubing, lens fronted, opaque backed, and ordinary glass tubing; files and snaps tubing into required length, forms bulb, loads tube with mercury, as for clinical thermometer blower; bends tube or otherwise shapes to form particular kinds of thermometers.